Thammayut Nikaya (Pali), literally «Those adhering strictly to the monastic discipline» is an order of Theravada Buddhist monks in Thailand. 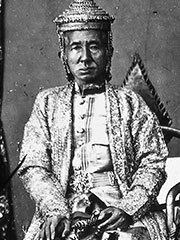 It was founded in the 19th century by King Mongkut, the son of King Rama II. Mongkut’s aim was to upgrade monastic discipline and make it more orthodox, after Mongkut noticed what he saw as serious discrepancies between the rules given in the Pali Canon and the actual practices of Thai monks. Mongkut also made an effort to remove all non-Buddhist, folk religious, and superstitious elements that had become part of previous practices. Thammayut monks were expected to eat only one meal a day and the meal was to be gathered during a traditional alms round. Thammayut Nikaya has produced two particularly highly revered forest monks: Phra Ajaan Sao Kantasilo Mahathera (1861-1941) and Phra Ajaan Mun Bhuridatta (1870-1949). Their bone fragments were distributed to various people and Thai provinces after the cremation and have since, according to their followers, transformed into crystal-like relics (Pali; Sarira-Dhatu) in various hues of translucency and opacity. The current Supreme Patriarch of Thailand, Somdet Phra Nyanasamvara Suvaddhana, is a member of the Thammayut Nikaya.